Was in John Lewis shopping for a sound system and was told you can save £70 on the Orbitsound T12 with a Partnership Card (new or existing), got myself a bargain and it sounds excellent! So did the OP pay £299 or £229? I didn't know there were deals like this with the Partnership Card. Thought it was just the vouchers you could get for spending on it. It's a pity there isn't a snapin cover for the iPod dock as it ruins the appearance when used as a Cinema/TV soundbar. Greyowl must be quite pernickity - i've had one of these in front of my TV since buying in John Lewis in January (at £299) and am never bothered by the iPhone dock aperture (think that's the correct word!) when it's not occupied by iPhone. In fact i never even notice it. I do find T12 really useful for playing music from my iPhone and video content from my iPhone onto Tv - as well of course as amplifying film and TV for a real boost to their sound. 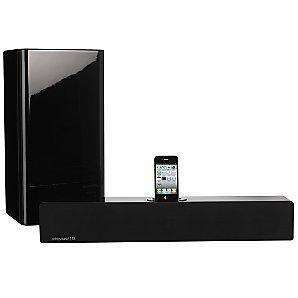 It's a really awesome piece of kit and my old hifi sits gathering dust these days as i play all my music via iPhone into T12 as well as having it on for TV and films. And i play radio through it from TV. If i'm at home my T12 is on! I've had six months of use since buying mine so cannot complain, but £70 off is a steal.